Muslim al Shishani and Dr. Abdallah Muhammad al Muhaysini embrace. Also pictured [right] is Abu Tarab al Shishani. A prominent Saudi cleric and a Chechen military commander in a unit of the Al Nusrah Front for the People in the Levant, al Qaeda’s official branch in Syria, celebrated together after recent heavy fighting against Syrian government forces in a mountainous area in the coastal province of Latakia. An emir of Ahrar al Sham is also seen in the video. Muslim al Shishani, a Chechen jihadist and Al Nusrah military commander, is seen in a video with Dr. Abdallah Muhammad al Muhaysini, an al Qaeda-linked Saudi cleric, after the Al Nusrah Front overran a Syrian military position in the eastern province. The video was posted on YouTube on March 26. In the video, hundreds of jihadists are shown walking around the captured outpost as fires, presumably caused by the the fighting, are still burning. A tank and a pickup truck with a machine gun mounted in the bed are seen in the background. Gunfire is heard, but it sounds celebratory. 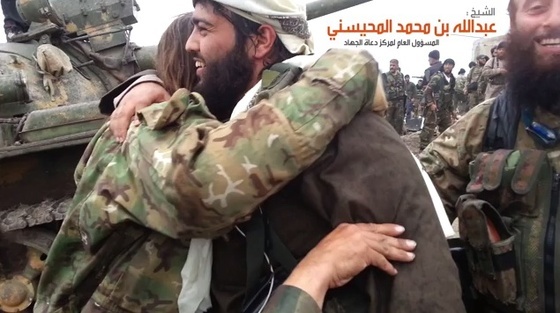 The camera follows the red-bearded Muslim as he praises the jihadists for defeating Syrian forces. At 0:58, the video pauses as Muslim is pictured with another Chechen commander, Abu Tarab al Shishani. The video then pauses again at 1:02 as Muslim and Muhaysini embrace. The video again pauses at 1:53 and Abu Tarab al Shishani is seen embracing with the “Leader of Ahrar al Sham: Abu al Hassan”, one of the leading groups in the Islamic Front. Senior al Qaeda leaders are known to have served in the top leadership circles of Ahrar al Sham. The Al Nusrah Front has allied with Ahrar al Sham and a Salafist group known as Ansar al Sham, in an offensive to take control of areas in Latakia. The jihadist groups have seized a coastal village, “the Armenian Christian village of Kasab,” and a border crossing with Turkey, according to Reuters. Muslim al Shishani has been waging jihad for three decades, according to a video biography that was released in November 2013 and translated by MEMRI. Muslim “served in the air defense division of the Soviet army in Moldova” before the collapse of the Soviet Union, MEMRI reported. Afterwards he joined the jihad in Chechnya and fought alongside Ibn Khattab, a Saudi who led al Qaeda’s International Islamic Brigade in Chechnya before he was assassinated by Russian forces in 2002. “He worked with many leading figures in the Chechen-Arab units, including Abu Jafar and Ibn Khattab’s successor Abu al Walid, and was eventually promoted to the position of field commander,” according to MEMRI. He was captured by Russian forces in 2003 and released after two-and-a-half years in detention. In 2008, he formed a fighting unit in the Russian Republic of Dagestan. He had sworn allegiance to Doku Umarov, the slain emir of the al Qaeda-linked Islamic Caucasus Emirate. In 2012, Muslim left the Caucasus to wage jihad in Syria and led a group known as Jund al Sham, or the Army of Syria. His group, along with those under the command of Saifullah al Shishani and another Chechen known as Abu Walid al Shishani, merged with the Al Nusrah Front. Chechen-led jihadist groups have been some of the fiercest units in the Syrian civil war. Chechens and others from the Russian Caucasus and even from the Ukraine hold prominent positions in jihadist units fighting in Syria. Omar al Shishani commands fighters in the ISIS and his fighters are routinely in the forefront of the fighting. Another Chechen, Salahuddin al Shishani, serves as the emir of the Muhajireen Army; his deputy is Abdul Karim Krymsky, a Crimean Tatar from the Ukraine. Hundreds of fighters from the Caucasus and Russia are known to fight in the ranks of the jihadist groups in Syria that are commanded by Chechen leaders. Two senior Chechen commanders, Saifullah al Shishani and Muhammad al Shishani, have been killed so far this year while fighting Syrian government forces in Aleppo. America should drone bomb that group. It’s footage from “Observatory 45”, 3C node for the Syrian Army. This rebel offensive will put significant pressure on the SAA, who will have to respond due to it’s proximity to key coastal areas and Assad’s home town. The rough terrain will level the playing field a bit, where the SAA will have to commit significant infantry assets to clear the area. There probably will be high casualties on both sides ( a plus for the rebels). If the rebels are smart, they would have pre-positioned units along probable re-enforcement vectors and engage them as they move north. Since many Chechens are involved, my guess is that they did that. Regardless, this conflict is going to go on for a long time, with the outcome still unknown. The location is very clearly a local high vantage point astride a significant road. Radio broadcast towers and electrical transmission towers are evident as the camera spins around. Strangely, other than the tank (T62? ), there seems to be no obvious sign of military improvements — such as bunkers and sand bags. Which begs the question: what constitutes ‘heavy’ fighting? Why hasn’t the Disposition Matrix been applied to syria ? They have islamic jihadist from all over the world killing innocents and Christians ? What’s up with that Bill ??? If I recall correctly Lattakia was the fall-back point for many Syrian refugees who didn’t flee across the border to Turkey, Jordan or Lebanon. This morning the regime vowed to retake the area within 48 hours, which is probably possible with the M5 highway being cleared for government use after the capture of Yabroud. Lattakia has been tenuously pro-Assad for the past few years, many Syrians who participate on Reddit’s Syrian Civil War discussion board claim to be living there, and citizens on both sides of the Turkish-Syrian border claim that Turkey is supporting and directing this operation for the rebels. I imagine the next big push is going to be for the SAA and Hezbollah to secure the Kessab border with Turkey to prevent this from happening again. Sincerely hope that Obama does not cave in to the Saudi demand for placing sophisticated weapons into the hand of the rebels. The jihadist groups will promptly capture those weapons because they are highly motivated. Once high tech weapons get into the hands of those social misfits, it will be letting the genie out of the bottle. Onwards it will be difficult to recap the bottle. Unless the United States starts bombing the large groups of extremist in Syria I cannot see a happy outcome if the rebels win.